Back in the day, if you wanted a large-screened Galaxy you went for the Note. It got more complex with the introduction of the S-series edge/plus and whatnot versions - display sizes have been converging between the two lineups in a process that peaked last year with the 6.2-inch S8+ and 6.3-inch Note8. In a minor departure from that trend, this year Samsung's fitted a 6.4-inch display in the Note - 0.2>0.1, after all. It's a Super AMOLED panel, naturally, with QuadHD+ resolution in the company-specific 18.5:9 aspect ratio - so, 1,440x2,960px and 516ppi. We measured a peak brightness of 658nits on the Galaxy Note9 in auto mode - incidentally, the exact same number as on the Galaxy S9. It is marginally better than the Note8's 647nits and slightly higher than the S9+'s 631nits. All of this year's Samsungs hover around 370nits in manual mode, while the Note8 could be pumped up a little higher to 412nits. The iPhone can achieve slightly higher peak brightness (679nits in our testing) than the Note9 and the LG G7 ThinQ's outdoor mode sends it way up into the 900s. The rest of the competition is behind the new Note, though the LG V30 and the Xperia XZ2 are keeping up - unlike the Pixel 2 XL, Oppo Find X, and OnePlus 6 for that matter. The number we recorded for minimum brightness was 1.9nits - excellent for keeping your eyes strain-free at night. When comes to sunlight legibility, in this market segment they are all good, but some are better. The Note9 belongs to the latter bunch posting a contrast reading virtually the same as the S9+'s, the two of them marginally behind the smaller S9. The iPhone is still uncontested at the top of the chart. We've gotten used to getting super accurate colors from Samsung's AMOLEDs over the last few generations - so long as we stay out of the Adaptive display mode. In this default state, you get the signature vivid AMOLED colors and a still-not-bad average DeltaE of 4.9 when compared against the sRGB target space. If you want accurate sRGB reproduction, Basic is the display mode for you (average DeltaE of 1.7), AdobeRGB is represented truthfully in AMOLED Photo (average DeltaE of 1.5), while AMOLED Cinema stays true to the P3 color space to the tune of an average DeltaE of 1.2. One of the major steps up from the Note8 to the Note9 is battery capacity - the new model packs 4,000mAh worth of juice compared to the 3,300mAh of last year's Note. It's a significant upgrade over the S9+'s 3,500mAh too, and one of the largest batteries in the class - it's the Note9 and the Huawei's, and that's it. The Note puts it to good use too, clocking just under 17 hours in our video playback test - incidentally the exact same result as the S9+, and some two-and-a-half hours more than the Note8. In the web browsing test, the Note9 lasted twelve-and-a-half hours, two more than the Note8 and 1:20h longer than the S9+. If you're one to do voice calls, the Note9 should last you more than 28 hours on a 3G network. Taking all of the above into account, plus the pretty good standby efficiency, we calculated an overall Endurance rating of 97 hours for the Note9. 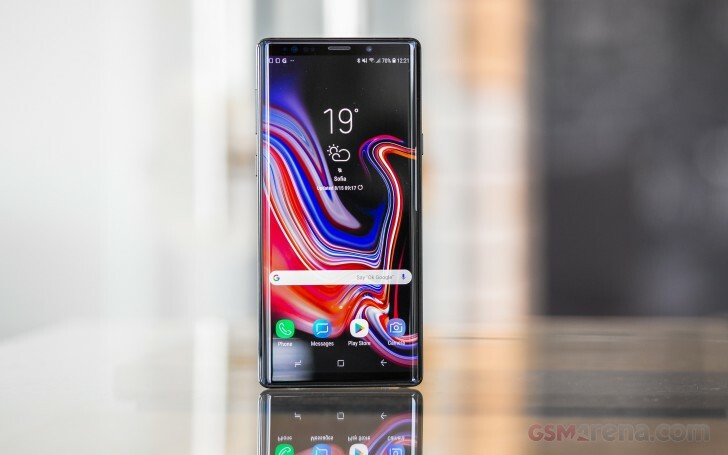 Our endurance rating denotes how long a single battery charge will last you if you use the Samsung Galaxy Note9 for an hour each of telephony, web browsing, and video playback daily. We've established this usage pattern so our battery results are comparable across devices in the most common day-to-day tasks. The battery testing procedure is described in detail in case you're interested in the nitty-gritties. You can also check out our complete battery test table, where you can see how all of the smartphones we've tested will compare under your own typical use. Regardless of battery capacity Samsungs seem to get to 37% in 30 minutes of charging from flat - that's what we measured on the S9+ and S9 (ok, 38% there, but the same ballpark), and that's what we got on the Note9. A full charge took 1:46h, so not half bad for a 4,000mAh cell, though we would've preferred a steeper climb in the first half hour. With the Galaxy S9 and S9+ Samsung finally fitted stereo speakers, and now that is finally making it to the Note lineup as well. It's the type of implementation where the bottom-firing driver covers the low end of the spectrum and one of the channels in the stereo pair, while the earpiece is responsible for the other channel's mids and highs. While in landscape, the speakers switch according to orientation, so the earpiece acts as left channel while the earpiece is on the left, and right channel if you hold the phone the other way around. When in portrait, the earpiece gets the channel it had last time the phone was in landscape. The Note9 falls in the 'Very Good' bracket in our loudspeaker loudness test, a little short of Excellent, but still a few decibels louder than the S9 and S9+. As such, it's also a substantial improvement over last year's Note8. The Samsung Galaxy Note9 got straight A’s on its audio quality report card. The phablet delivered perfect scores and loud output with an external amplifier, but as it turned out, that wasn’t anywhere near the most impressive part of its performance. When we hooked up a pair of headphones the output was virtually unaffected - no stereo crosstalk spike, no intermodulation distortion nor any drop in loudness. It’s undoubtedly the best result we’ve seen this year and one that should put the Note9 on top of any audiophile’s list.